Location: 0.5 miles west of Fourth Street on Mapleton Ave. The Mount Sanitas loop hike begins at the base of Sunshine Canyon, traversing the ridge line of Mount Sanitas and then descends down its eastern slope to the valley floor and joins the Sanitas Valley Trail. This popular hike offers spectacular views of the Indian Peaks wilderness area to the west, Boulder City to the east and the Flatirons two the south. Along the way it meanders around beautiful sandstone slabs and through stands of ponderosa pine. Climbers use the trail to access several bouldering areas along the trail. 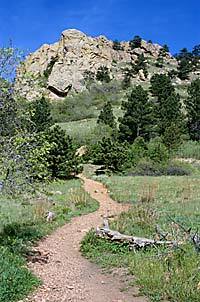 A shorter hike in the Mount Sanitas area is Dakota Ridge. Accessed from the same trailhead, Dakota ridge runs off to the east. An easy half-hour jaunt along Dakota Ridge meets the top of the Boulder Valley Trail and a scenic lookout over Boulder City. You can swing back down the Boulder Valley Trail to the trailhead.